I cry at movies. Sometimes I think this is totally understandable. At the end of Saving Private Ryan, I sobbed as big fat tears fell down my face. I couldn’t stop thinking about men who had maybe died so my grandfathers could come home. I know, I’m a of bit of a wreck in this way, but I can’t help it, I’m an emotional guy. 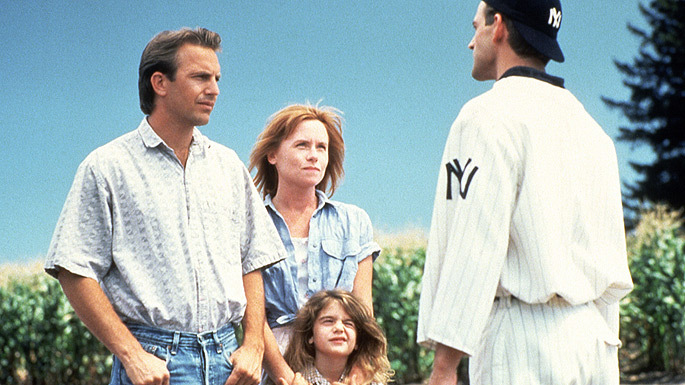 I cry at a lot of movies, but no movie makes me cry like Field of Dreams. I played a little baseball in high school and so that whole baseball theme has a lot of emotional energy for me. (“Emotional energy”? What a pansy thing to write. What is wrong with me? Sorry. Moving on.) The part when Moonlight Graham steps off the field to save the little girl from choking and you know that he can’t go back; he can’t go back to his dream of playing baseball – wow. Almost crying just writing about it. The real movement from normal human to puddle of tears, uncontrollable cry snot, and quick breaths between sobs comes when Ray’s dad comes to the field to play and Ray says, “Hey dad, how about a catch?” Niagara Falls. I was concerned I may have some unresolved father issues (Dad, if you are reading this, I’m sure it’s nothing), but the more I thought about it they were tears of thanksgiving for a dad that I did get to play catch with, a lot. I had a great father who coached my baseball teams, but also helped with homework and took me to church and watched Holy Grail with me despite my mother’s protests.